Immune checkpoint molecules mainly includes programmed cell death protein 1 (PD-1) and cytotoxic T-lymphocyte antigen-4 (CTLA-4) [1, 2, 3, 4]. As the vital components of immune homeostasis, immune checkpoint molecules downregulate magnitude of immune response and participate in peripheral tolerance . However, upregulated immune checkpoint signaling pathways such as PD-1/PD-L1 protect cancer cell from immune surveillance . Therefore, immune checkpoint molecules and their ligands are ideal anti-cancer treatment targets. It is well established that anti-PD-1/PD-L1 upregulates Ras-Raf-MEK-ERK and PI3K-AKT signaling pathways in immune cells by blocking PD-1/PD-L1 axis . As a result, anti-PD-1/PD-L1 therapy restores T cell from exhausted status and enhances tumor-killing activity . Relatively, mechanisms by which anti-CTLA-4 therapy destroys cancer cell are still controversial. It is generally believed that anti-CTLA-4 recovers the co-stimulatory signaling pathway CD28-B7 which is usually hijacked by CTLA-4 in tumor microenvironment [9, 10]. Additionally, it is proposed that anti-CTLA-4 could directly eliminate regulatory T (Treg) cell by antibody-dependent cell-mediated cytotoxicity [11, 12, 13]. Solid tumors tend to secret multiple pro-angiogenetic factors such as VEGF (also known as VEGF-A), hepatocyte growth factor, and platelet derived growth factor. Among these factors, VEGF plays a core role in angiogenesis [21, 40]. The angiogenetic signal of VEGF is mainly transducted by its receptor VEGFR2 [41, 42]. VEGFR2 contains a ligand-binding domain with 7 immunoglobulin-like structures, a trans-membrane domain, and a tyrosine kinase domain . On the one hand, VEGF-VEGFR2 promotes secretion of von Willebrand factor (vWF), proliferation and migration of endothelial cell (EC) by activating downstream PLCγ-PKC-Raf-MAPK and Grb2-Gab1-MAPK/PI3K-Akt signaling pathways . On the other hand, VEGF-VEGFR2 could increase vascular permeability by activating VEGFR2–TSAd–Src-cadherin and PI3K–Akt–eNOS–NO signaling pathways (Fig. 2a) [23, 44]. Therefore, VEGF and its receptor VEGFR2 are predominant targets for the development of anti-angiogenesis agents. Anti-VEGF monoclonal antibody (mAb) bevacizumab is the first anti-angiogenesis agent which is approved for multiple cancers including metastatic colorectal cancer, metastatic non-squamous non-small cell lung cancer, metastatic renal cell carcinoma, recurrent glioblastoma, recurrent ovarian cancer, recurrent/metastatic cervical cancer . Following the invention of bevacizumab, a variety of VEGF-VEGFR targeted agents come out. Apart from anti-VEGF mAb, there are other three approaches to inhibit VEGF-VEGFR signaling pathway: (I) decoy VEGF-trap receptor such as aflibercept ; (II) anti-VEGFR2 mAb such as ramucirumab ; (III) tyrosine kinase inhibitor (TKI) which interferes intracellular signal transduction of VEGF such as axitinib, sorafenib, sunitinib, and vatalanib [48, 49, 50, 51]. Moreover, based on chimeric antigen receptor (CAR) T cell technology, Chinnasamy et al. developed anti-VEGFR2 CAR T cell to retard tumor growth . Anti-VEGFR2 CAR-T therapy is verified as an effective strategy inducing tumor regression but its effect needs further investigation in human. 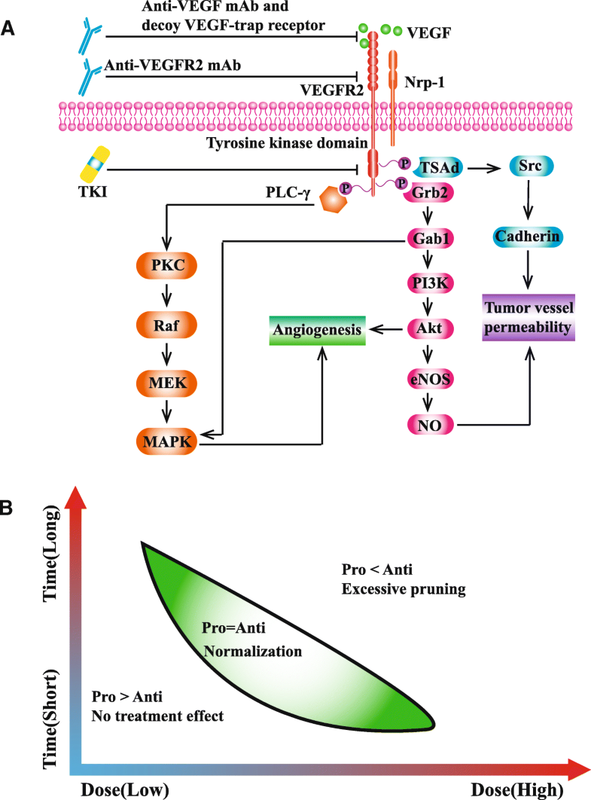 Tumor immune escape closely relates to angiogenesis. In turn, tumor angiogenesis highly depends on immunosuppressive microenvironment. Activated T cell secrets interferon-γ (IFN-γ) which could directly promote tumor vessel normalization and regression by IFN-γ receptor on tumor endothelial cell (Fig. 3) [68, 69, 70]. 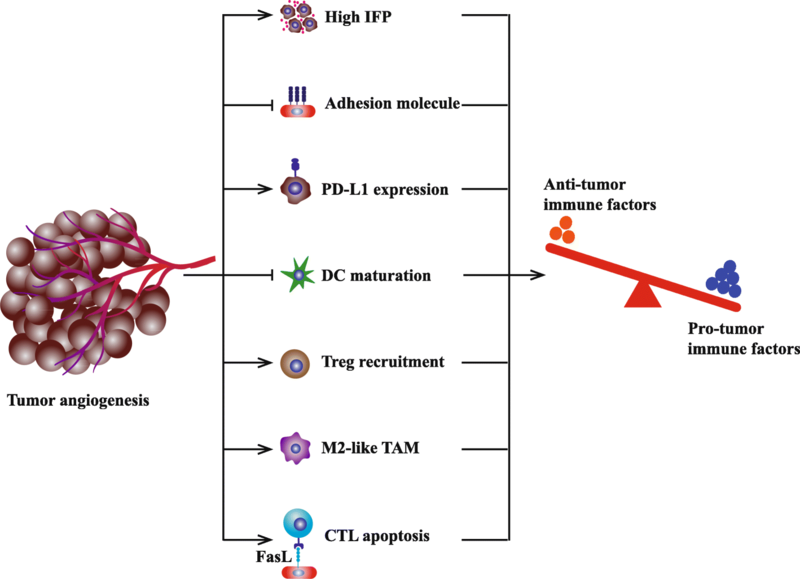 Based on the interaction between tumor immunity and angiogenesis, it is speculated that anti-angiogenesis might enhance the efficacy of ICI. As early as 2013, Yasuda et al. observed the synergistic effect between ICI and anti-angiogenesis in mice bearing colon adenocarcinoma . Subsequently, Wu et al. verified that ICI plus anti-angiogenesis could effectively prolong overall survival (OS) in mice bearing kidney and mammary tumors . 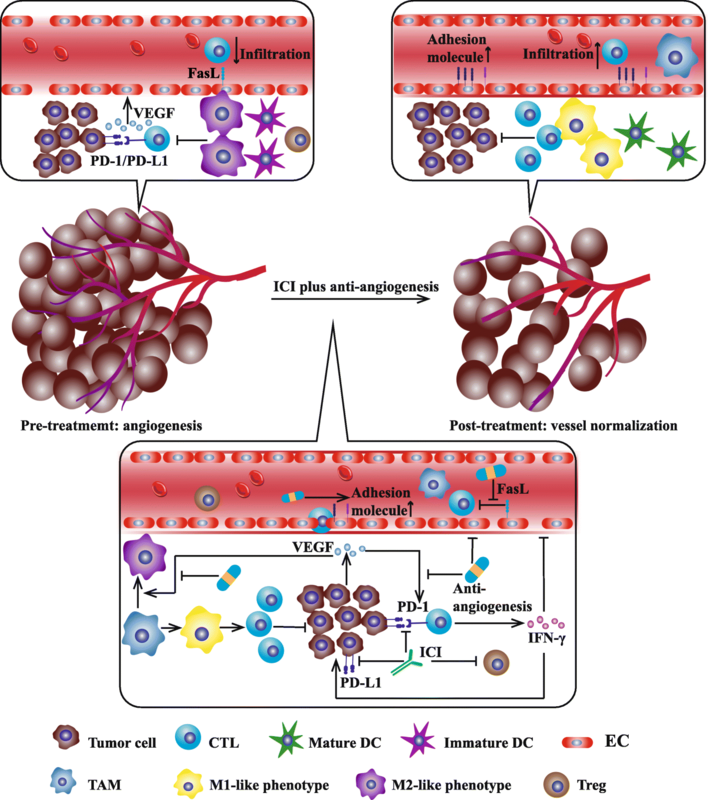 However, apart from decreased interstitial fluid pressure and correspondingly improved T cell infiltration, we could not rule out other mechanisms by which ICI and anti-angiogenesis synergistically kill tumor cell. Thus, further explorations should be conducted in expanding models. To date, multiple mechanisms have been found to relate to synergistic effect. Apart from VEGF signaling pathway, angiopoietin-2 (ANGPT2)/Tie 2 is another pro-angiogenic pathway which relates with resistance to anti-VEGF treatment [75, 76, 77]. Schmittnaegel et al. confirmed that the dual blockade of VEGF and ANGPT2 by bispecific antibody A2V provided a more potent therapeutic effect than monotherapy . In the meanwhile, the treatment effect of dual blockade could be further enhanced by anti-PD-1 treatment . 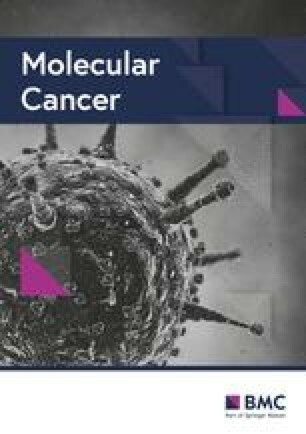 In this preclinical study, multiple tumor bearing mouse models were employed including transgenic or transplanted breast cancer, pancreatic neuroendocrine cancer, melanoma, and colorectal adenocarcinoma models . After A2V treatment, the abundance of anti-tumor immune cells including mature DC, M1-like phenotype TAM, IFN-γ+/CD69+ CD8+ T cell increased . In the meanwhile, increased perivascular CD8+ T cells accompanied the high expression of PD-L1 on tumor cell because of IFN-γ-mediated negative feedback regulatory mechanism . Combination therapy of anti-PD-1 and A2V blocked the negative feedback loop and magnified the immune response . The results showed that more than 30% mice receiving combination therapy possessed prolonged OS compared with A2V therapy . Allen et al. 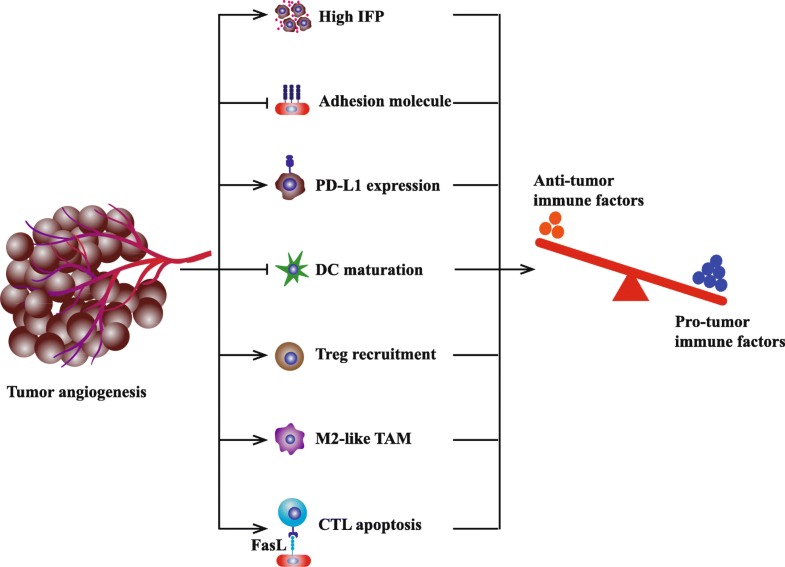 investigated the efficacy of combination therapy of anti-PD-L1 (anti-PD-L1 mAb: B20S) and anti-VEGFR2 (anti-VEGFR2 mAb: DC101) in mice bearing pancreatic neuroendocrine tumor, mammary carcinoma, and glioblastoma . Combination therapy showed a great advantage in tumor control and OS over monotherapy in pancreatic neuroendocrine tumor and mammary carcinoma but for glioblastoma . After 2 weeks treatment of anti-PD-L1 plus anti-VEGFR2, the level of IFN-γ+ CD8+ and IFN-γ+ CD4+ T cell increased by twofold in pancreatic neuroendocrine tumor and mammary carcinoma. However, IFN-γ+ CD8+ T cell modestly increased in just 50% of glioblastomas . As the direct barrier for T cell extravasation, intratumoral vessel was speculated as the primary factor contributing to the impeded T cell infiltration in glioblastomas . Apart from more intact pericyte coverage, vessel in pancreatic neuroendocrine tumor and mammary carcinoma was thickened with plump endothelial cells rather than flat endothelial cells, displaying the unique characteristic of high endothelial venule (HEV) . Immunohistochemical analysis confirmed this phenotype transformation of endothelial cell. It is generally believed that HEV is associated with lymphocyte homing [80, 81, 82]. Similarly, it was speculated that intratumoral HEV promoted T cell infiltration into tumor . LTβR signaling pathway is essential to sustain HEV phenotype . Activating LTβR signaling pathway by its agonist during combination therapy could effectively eliminate glioblastoma, indicating the vital role of HEV formation in combination therapy .